When I think tulle, I used to think of Tu-tus and crinolines. But lately, I’ve been thinking of accessories. From tulle flowers that I pin on my coat and in my hair, to these so cute tulle bead necklaces. I sat down with my materials and whipped these babies up in less than 20 minutes. Can you believe that!? Not to mention beads and tulle all together cost me less than $6.00. Not bad for a fresh new accessory look. What do you think? 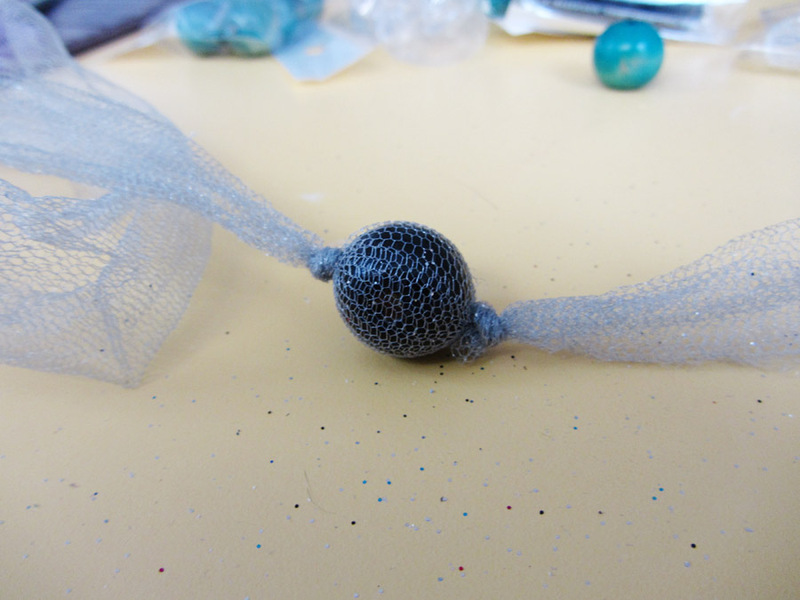 Also, this some project, with shorter tulle (like a bracelet) could be a great girls craft for a party or sleepover. Maybe pair it up with the DIY T-Shirt necklace? 2 types of beads. 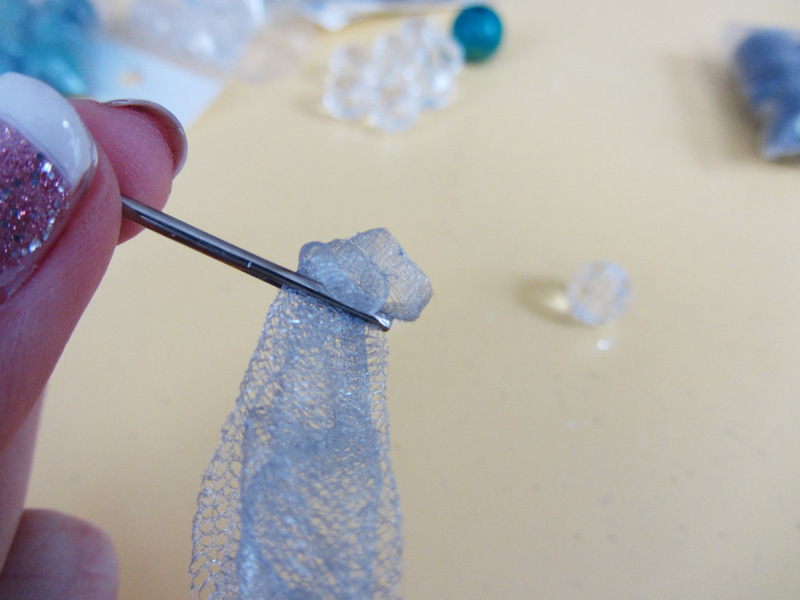 One type to get wrapped in tulle, and one to thread onto the tulle. 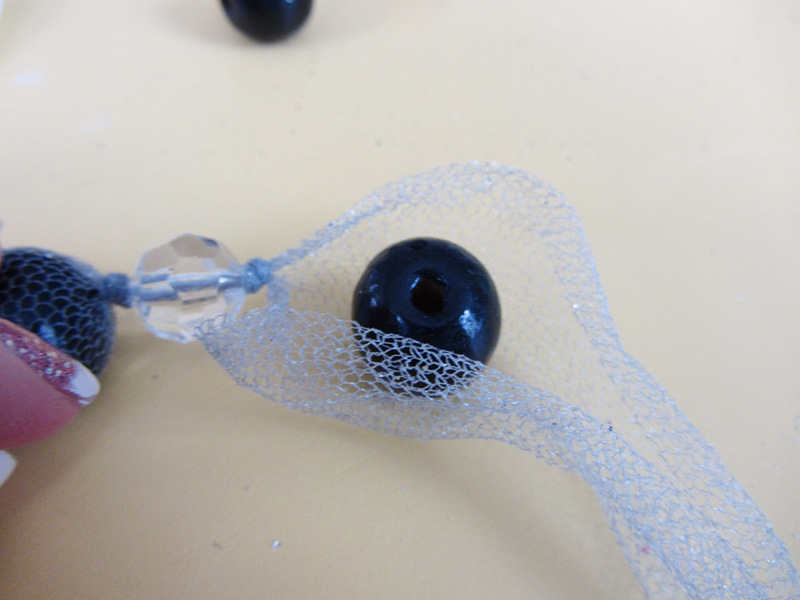 I chose one group of solid colored beads for “inside”, and one group of clear for “outside”. The clear will show through to the color of tulle you choose. Note: the thread hole of the “outside” beads needs to be large enough for cording (about 1-2mm.). Tulle, about 4” off of a bolt. Any color will work, as will most nettings and lace. A large needle with a large eye. Lay your tulle out. 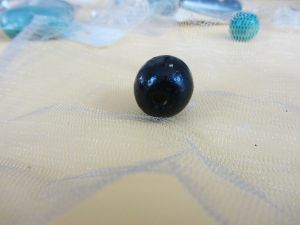 Place on of your “inside” beads down. Roll it up in the tulle, and tie a knot at either end. Next, “thread” your needle with just a bit of the tulle. 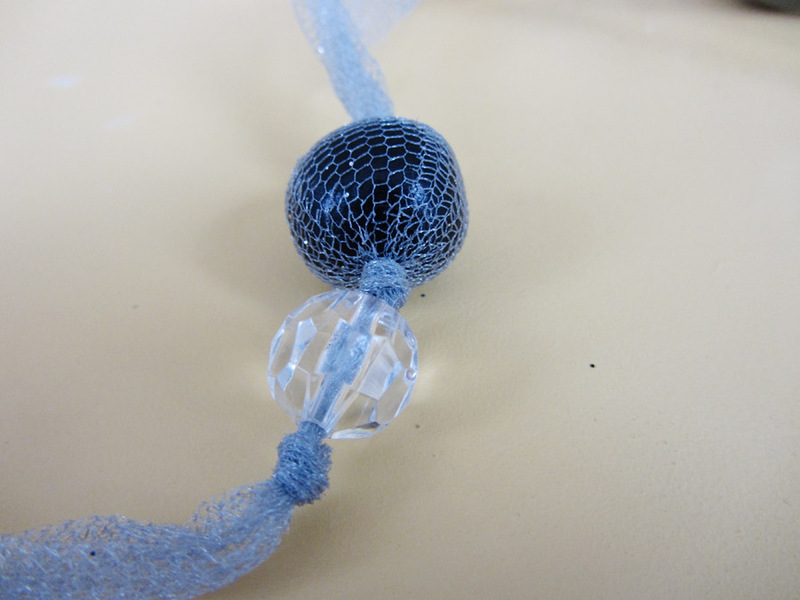 Push it through one of your “outside” beads. Push your outside bead down to meet your inside bead. 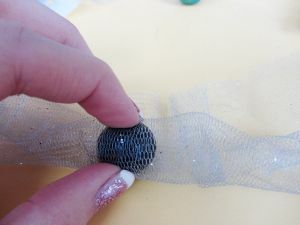 This part might take some elbow grease at first, as the tulle stretches and become thin enough to wiggle through the bead. Tie a knot to hold the outside bead in place. 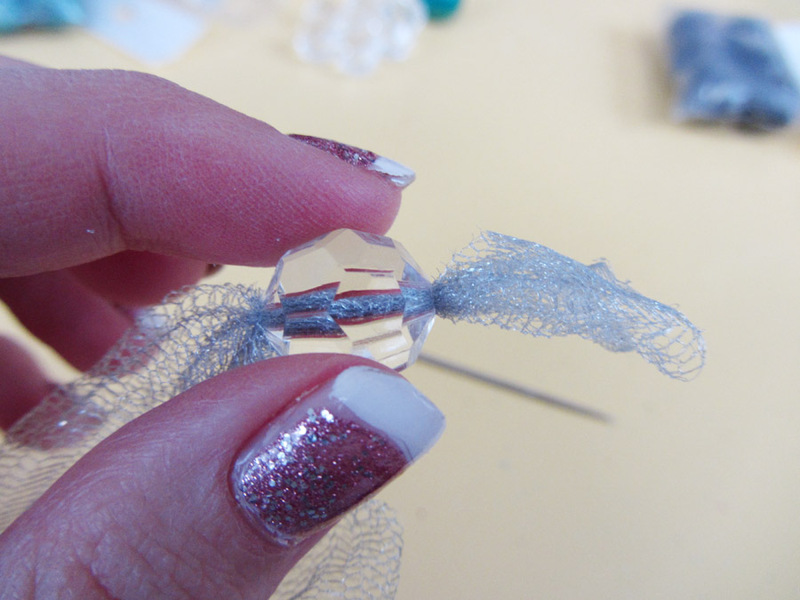 Open the tulle up again next to your outside bead, and put an inside bead inside. 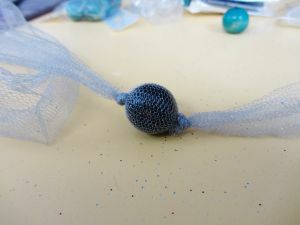 Be sure to overlap the tulle as much as possible while wrapping this bead, so it does not fall out after you’ve tied it in. Tie a knot next to the bead. Repeat as many times as you desire. I’ve made a couple necklaces with beads about half way, and one with beads all the way around. 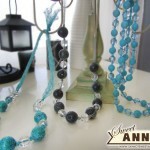 Tie off your necklace when it reaches your desired length. Tada! 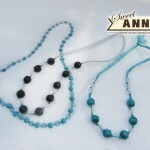 What a beautiful, easy, and elegant necklace! Thank you so much for always having something so wonderful to share at Rook No. 17! So lovely! Thanks so much for sharing at Taking A Timeout Thursday!